Infrastructure, at face value, may not seem essential to global security. However, it’s necessary to keep roads, power lines, and more up-and-running when planning for the future of security. When it comes to security issues, infrastructure certainly isn’t the first to come to mind—but ignoring the importance of maintaining a proper infrastructure creates numerous vulnerabilities. Nations around the world rely on railroads, regular roads, power lines, waterways, and more just to facilitate their economies. Many of these things also play a critical role in global security, though, and without the right systems in place, it becomes difficult to maintain many of the security protocols currently in place. Around the world, many nations are suffering from crumbling infrastructure that poses a serious risk for the future. 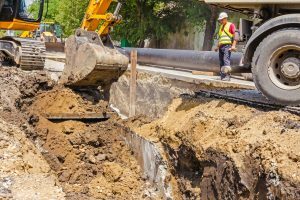 Let’s take a look at three reasons why maintaining infrastructure is an essential element in establishing global security. Operational efficiency is an essential part of infrastructure security. Being able to quickly respond in the event of a disaster or some kind of security breach, whether from an external force or something internal, often becomes an important element in how we keep ourselves secure. This allows us to best eliminate risks and makes it so that emergency responders are able to quickly and effectively reach where they need to be. Transportation isn’t just essential to first responders, though, but in circulating the tech that keeps us safe. Everything from access control technology to driver cameras ends up being shipped from somewhere and maintaining roads, railways, and even ports is critical in that. Many security elements rely on power to keep running. Granted, in many facilities, there are generators just in case such an event would take out some particular set of security technologies. With that in mind, though, keeping the grid as a whole up allows for seamless communication and can go a long way in ensuring that many essential elements of modern approaches to security are left up and running. In the event of a terrorist attack, it seems much more likely that targets that are already hindered by damaged infrastructure are going to be the ones getting hit. In some instances, failures in infrastructure can reduce efficiencies so much that they create bottlenecks where security becomes almost impossible. When roads and railways get clogged up because the system isn’t failing, it makes for much more vulnerable targets that cannot be further exposed. This entry was posted on Friday, April 12th, 2019 at 3:18 pm. Both comments and pings are currently closed.